Had a fun shoot for Red Bull last weekend, the Wings for Life World Run in Denver. Since the global world run included events in 35 different countries, all starting at the exact same time, our shoot included a 2:45am call time and 4am race start. Thus the first two hours of the race, winding through the streets and suburbs of Denver, would be in complete darkness, with only the occasional street light illuminating the course. With impeccable timing, my new Nikon D4s bodies had arrived earlier in the week and it was a great opportunity to put them through the paces, not to mention leverage the incredible high ISO performance of a camera where 25,600 ISO is within the “native range” of the camera. Performance can be extended above this with the High ISO settings up to an incredible 409,600 ISO equivalent, but without the adequate time to test those settings, I stayed within the native range. The results were impressive to say the least. It boggles the mind to see how far low light performance has progressed in the last 5 years or so, first with the large gains of the Nikon D3, and now the continuing progression of more recent cameras. I’ll also note the new Group AF autofocus functionality exceeded expectations, locking on to runners in near darkness and holding focus in extremely difficult conditions, often backlit with support vehicle headlights. 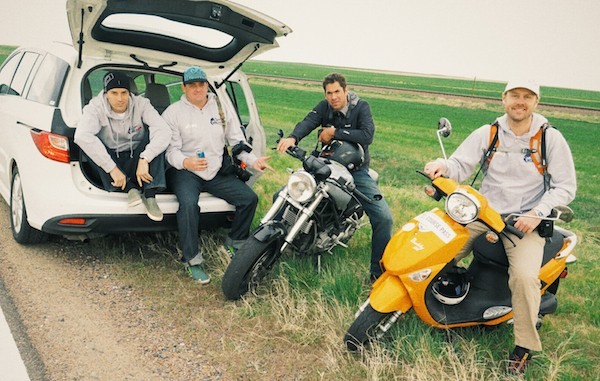 Red Bull Photo Team: Marv Watson, Lucas Gilman, Balazs Gardi and yours truly. All in all, it was a super fun shoot and was really pleased with quality and performance of the new gear in certainly challenging conditions! I’m really looking forward to working with the camera in the coming weeks to leverage all of its potential.